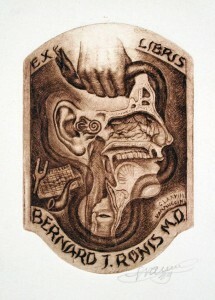 The exhibit “Ex Libris: Contemporary & Antique Bookplates” at Davidson Galleries in Seattle celebrates the art of bookplates, which identify books’ owners. There’s something intimate and slightly thrilling about opening a book and finding a bookplate pasted inside the cover. These small prints give us a glimpse of the owner through an illustration of the owner’s name or identifying symbols. Bookplates often include the words “Ex Libris,”a phrase that denotes “from the books,” but has come to mean “from the library of” and is also another name for the bookplate itself. Riding a wave of nostalgia, bookplates are currently highly collectible as stand-alone prints that are enjoyed quite apart from the books in which they were originally meant to live. Lining the back walls of the Davidson Galleries is a quiet but fantastically rich exhibition of antique and contemporary bookplates that draw you into little worlds of identity, pleasure, or warning. Shayla Alarie, director of the gallery’s antique print department, and Cara Forrier, director of contemporary prints and drawings, have pulled together over 200 Ex Libris from private collections and their own inventory (about 100 are hanging on the walls, with the rest in portfolios that can be perused).